How to reach : Nearest town to the wetland is Makhu(Ferozepur) Railway Station and Bus Stand is situated 10 km south of the Harike town, which connects to Ferozpur, Faridkot and Bhatinda by the National Highway. 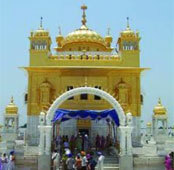 It is the primary religious centre in Tarn Taran Sahib. Sri Guru Arjan Dev Ji constructed this place. The biggest sarovar in the entire world can be seen here.